Please feel free to contact us for potential spots or to be waitlisted. 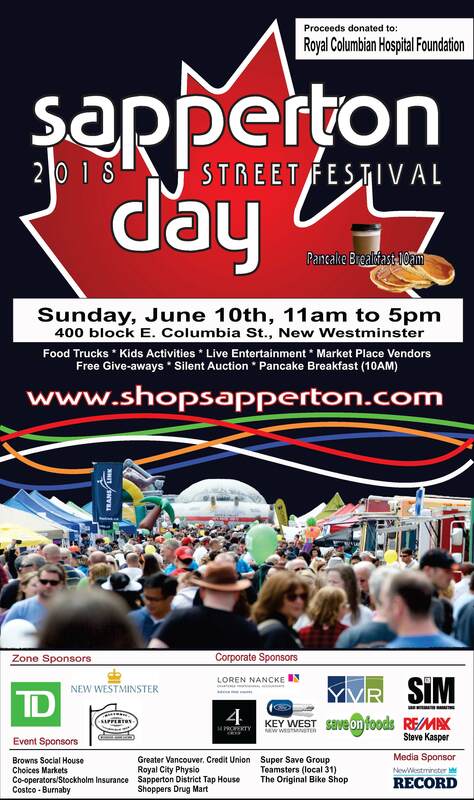 *	The Sapperton Day Street Festival is an outdoor event - rain or shine. There are no refunds. *	All participants are juried and will be accepted on a "first paid" basis. *	We reserve the right to limit the selling and promotion of identical products. *	Vendors and Non-Profits will be provided with a 10' X 10' space on the street. Spots are limited! *	We recommend you bring your own canopy tent (no larger than 10 X 10). *	Tables, chairs, tents and power are not provided. *	All participants are asked to be on the street before the street closes at 9am. *	Set up & take down times are enforced. *	Site maps & parking passes allowing you to enter the festival site will be sent via email 2 days before the event. *	All vehicles on the street should be to assist in set up only - your car must be moved before 11am. *	Parking will not be allowed on the street during the festival unless as part of a pre-approved display. *	We suggest that you arrive early to unload items on the sidewalk near your designated area before street closure in order to park your car elsewhere. *	Parking is available in neighbouring streets; please watch for enforced parking regulations. *	It is not possible for festival organizers to guarantee any particular location or stage sightlines. *	Vendors are asked to remember this is a family event & are not to sell, display or advertise any improper, offensive or illegal products or services. *	Market Place Vendors may not perform or sell beverages and/or ready-to-eat food items. 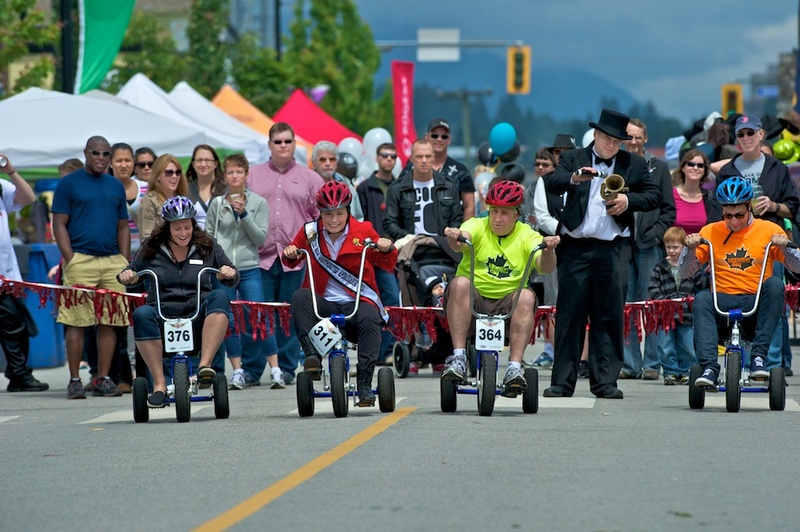 The Sapperton Day Street Festival reserves the right to limit, curtail, or refuse any participant activity, display space, merchandise or service. Note that promotion or marketing of associate businesses during the Festival is strictly prohibited in order to honor sponsors & other participating businesses. The Festival is not responsible for any lost, stolen or damaged inventory or items used to promote your business/ organization during the Festival. Any vendor may request a double booth which will be charged at full price - there is no quantity discount. The Sapperton Day Street Festival reserves the right to grant or deny any requests for additional booths. As stated above the Sapperton Day Street Festival is also a fund raiser for the Royal Columbian Hospital Foundation. As such the event features a pancake breakfast, hot dog, soda & water sales to raise money. No food vendor is to sell those products on the street unless pre-approved & collecting for RCHF. Please note that Event Sponsors may require food vendors to restrict sales and promotions to a specific brand. ie: Coke, Dasani etc... Information on Sponsor restrictions is available, please contact us. Food Vendors must be self sufficient, power and water not provided. - Terms Negotable, contact us for further information. - Ability to offer product sampling, give-a-ways or swag. - Up to 10'x45' of event space. - Up to 2x tables (if pre-arranged). - Company logo on all volunteer t-shirts. - Company logo displayed on event day sign boards and recognition by emcee hourly. - Company logo displayed on posters & print media ads. - Acknowledgement on website and social media. - Up to 10'x20' of event space. - Company logo displayed on event day sign boards and recognition by emcee periodially through day. - Company name listed on event day sign boards and recognition by emcee periodially through the day. - Listed on the Shop Sapperton website business directory throughout the year. - Acknowledged on website as a supporter of the event. - This includes brick and mortar restaurants but not mobile food vendors. - defined as a community or charitable organizations promoting awareness of a specific cause. - not permitted to sell any products, raffle/prize tickets, subscriptions or memberships of any kind. * We accept Cash, Cheque or Paypal payments only. For more sponsorship details or to apply to be a vendor, please download the applicable form in the left column. See our ads in the New Westminster Record or please feel free to email us for more information.